Hezekiah quarter will help young families and revitalize a historic neighborhood. Rabbi Chaim Hezekiah Medini would likely be proud to know that 114 years after his passing, a neighborhood named after him is finally being renovated. The 31 new housing units in the Hezekiah quarter will be the first new construction in the H2 section of Hebron in 16 years. All building and zoning permits in Judea and Samaria must be approved by the IDF Civil Administration, and in the case of Hebron, even signing a deed often leads to multiple court cases. In this case, part of an army outpost will be converted into residential units meaning the plan needed an extra signature. The entire sum that the government has allocated for the project will be to relocate and renovate the army post which has been at the site for the past 30 years. The actual funding of the residential project will be paid by the Jewish community of Hebron and the new residents that purchase the apartments. kindergartens and public parks. We will continue to strengthen the communities in Judea and Samaria, by action, not just words." When the approval finally passed on Sunday he announced, "A new Jewish neighborhood in Hebron, for the first time in almost 20 years. Instead of a military camp we will establish a new neighborhood. 31 apartments, 2 kindergartens and a dormitory will be built. I thank the Prime Minister and the cabinet ministers who signed the approval of the Hezekiah Quarter plan. This is yet another important milestone in the extensive activity we are leading to strengthening settlement in Judea and Samaria." The local resident's committee released a statement which read, "The Jewish community of Hebron thanks the government of Israel for its determined decision to build, together in a joint effort, the City of the Patriarchs and Matriarchs. This is the answer to all deniers of history. Knesset Speaker Yuli Edelstein announced, "just a month ago we opened the new school year with our dear Hebron residents. Next year, we will begin studies with two additional schools and another kindergarten which the government approved today. New apartments will be built here for new families and the Jewish settlement in the city of our forefathers will strengthen even more." The land in question is around the corner from the Beit Romano building, today home to the Shavei Hevron yeshiva. Built in 1876 by Hayyim Yisrael Romano, it was here that Rabbi Medini completed his monumental Talmudic encyclopedia the Sde Hemed between the years 1901-1905. Rabbi Medini served as chief Sephardic rabbi of the city and is buried in the ancient cemetery. rabbis who lived and taught on site. During World War I, when the British defeated the Turkish in 1917 and took control of the Land of Israel, they converted Beit Romano into the headquarters of the British police. When city finally returned to Jewish hands in the Six Day War of 1967, the seventh Lubavitcher Rebbe, Rabbi Menachem Mendel Schneerson, turned over all rights to previously held Chabad property to the nascent Jewish settlement, giving his blessing to the young families seeking to repopulate the neighborhoods. Today, around the corner from Beit Romano, small caravan style trailer homes are used by students and young families, with a building used by the army nearby. These will make way for much-needed new housing which will alleviate crowding and add to the economy. Those who grew up in the Hebron community faced the prospect of moving away after getting married, sue to lack of adequate housing. This is the first new project in Hebron's Jewish neighborhoods since the 2002 development in Tel Hevron. 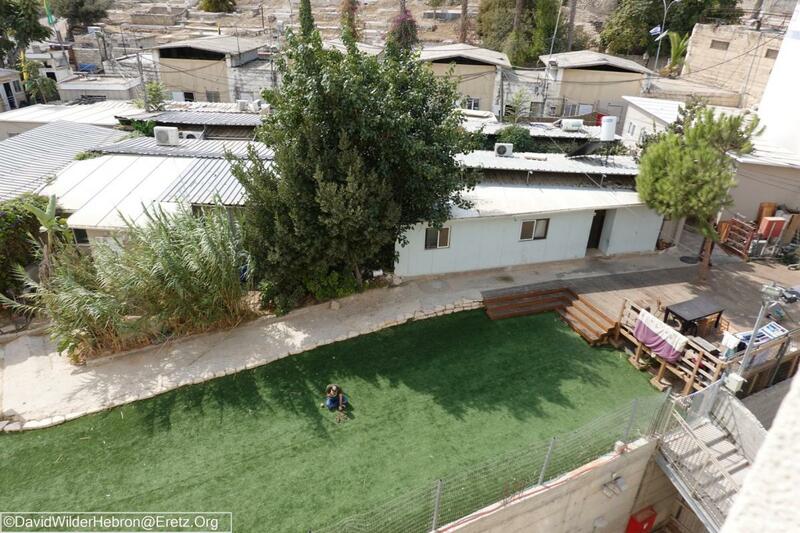 The new neighborhood in located within the small confines of the H2 section of Hebron, controlled by Israel which includes the Tomb of Machpela. Israelis are permitted to walk only within the Jewish neighborhoods except on special occasions. By contrast the 80% of Hebron controlled by the Palestinian Authority is the largest and most industrial of the PA cities. The constant building includes a new annex to the towering Hebron Center shopping complex, completely off limits to an Israelis. When the Civil Administration first announced the preliminary approval earlier this year, the Jewish community of Hebron responded saying, "building in the City of the Patriarchs by the Israeli government is a Zionist, just, necessary and blessed step. Upon receiving the building permit for the Hezekiah Quarter, we congratulate and thank the Prime Minister and all the ministers, Knesset members and public figures who worked with determination and dedication together with us to advance the building permit." * UNESCO Again Calls Hebron Part of "Occupied Palestine"